On this day in 1917, Babe Ruth, then a pitcher for the Boston Red Sox, walked his first batter on four pitches, and was ejected for arguing with the home-plate umpire. 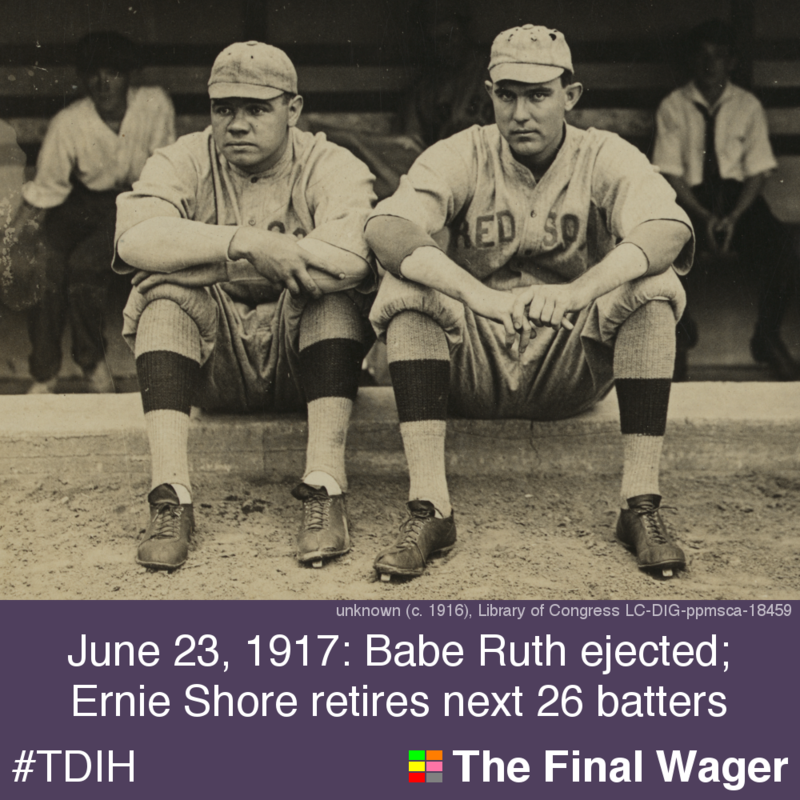 Ernie Shore replaced him, threw out the runner at first, and retired the next 26 batters – an “unofficial” perfect game. An official perfect game occurs when a pitcher (or pitchers) retires each batter on the opposing team during the entire course of a game, which consists of at least nine innings. In a perfect game, no batter reaches any base during the course of the game. Harvey Haddix, Pittsburgh Pirates, 1959: sometimes referred to as the greatest pitching performance ever, Haddix retired the first 36 Milwaukee Braves he faced. The leadoff Brave in the 13th reached on an error, and eventually scored, giving Haddix a 1-0 loss. Pedro Martinez, Montréal Expos, 1995: the Expos (who became the Washington Nationals in 2005) finally got a run in the top of the 10th inning, but Pedro gave up a lead-off double in the bottom half. He was still was credited with the win in the 1-0 victory. In 2000, Pedro was the first of six Red Sox pitchers in a combined perfect game against the Toronto Blue Jays. It was in Spring Training, however, rendering it “unofficial” for statistical purposes. Cy Young threw the first modern perfect game, in 1904; the most recent was by Felix Hernandez of the Seattle Mariners in 2012. For more on perfect games, visit Baseball Almanac.